The Village of Frankfort is located less than an hour from downtown Chicago in Will County, Illinois. The Village of Frankfort Smartphone Application is a free application that serves as a resource for both residents and visitors. Including department and staff directories, an event calendar, video updates, police alerts and a service request form, this interactive tool is a great way to keep up-to-date with happenings in the community and stay involved. Download the Village of Frankfort App today! 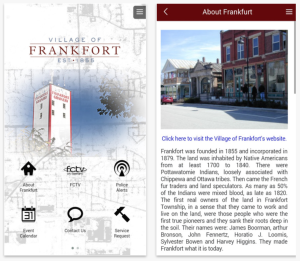 Click here to download the Village of Frankfort Smartphone Application on iTunes. Click here to download the Village of Frankfort Smartphone Application on Google Play. Constituent Outreach Consultants Inc. helps elected officials, municipalities and other government organizations communicate with their constituents more often and more effectively, using the latest in technology, social media and telecommunications. Copyright © 2015 Constituent Outreach Consultants, Inc.